I wish to give my thanks to The Concord Monitor and Christine Hamm for use of this copyrighted article. 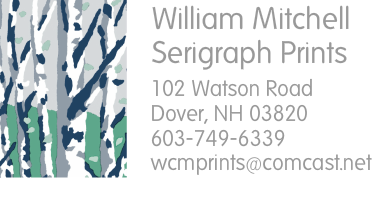 If you’re a fan of puffy clouds and blue skies, deep woods and dappling light, proud mountains and 100 mile views, then you’re likely going to love William Mitchell’s collection of silk screened prints at the League of New Hampshire Craftsmen’s shop at 36 N. Main Street in Concord. Just about everyone doe. Shop manager Jan Dow says she know that if she hangs Mitchell’s warmly colored New Hampshire inspired landscapes in the store window in January, customers will inevitably come in from the cold. In fact, she says this juried craftsmen’ work is a draw every month of the year. But this month is extra special, Since May, Mitchell’s prints have been the feature exhibition that is traveling around the state to each of the league’s eight shops. September in Concord’s turn. This month, old Mitchell fans and new can count on seeing more of the artist’s work than ever, including a panoramic scene of Franconia Notch in autumn, commissioned especially for this exhibit. Looking at Mitchell’s prints, it’s clear that his natural exuberance and his love affair with his adopted state is what makes it easy for the rest of us to connect. 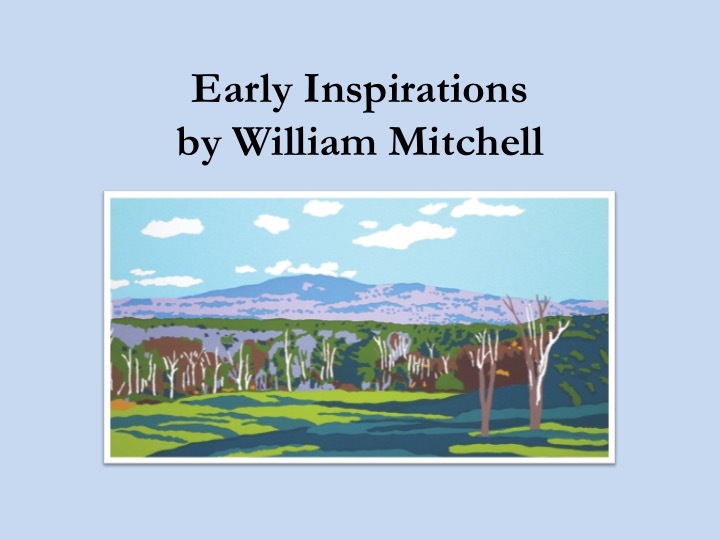 Mitchell does with color and form what Rachael Carson did with words. When he hikes down a mountain a sees a view opening like gangbusters amid the trees, he doesn’t just feel like this is what life is all about, he articulates it, recapturing for all of us a great day in the woods. Or a sunset, speckling the dark Pemigewasset with strands of mauve and pink. Or a opulent midsummer afternoon in the garden’s of Portsmouth’s Prescott Park. Or a drive through a New Hampshire village when the church spires all grasp hands with the gods. Although Mitchell grew up in the Catskill where he learned to hike and love the outdoors, he knew he’d come home when he moved to Dover in 1983. Mitchell first learned serigraphy( screenprinting to most of us) as an art major at the State University of New York College at Oneonta. Later he studied at the Museum School in Boston. “When you think about being an artist, you think, well, I’ve got to be a commercial artist, but you just have to tell yourself that doesn’t have to be so. I knew I would have to be in a city to get started, but I tried the city thing and I felt like I was ina cage, totally cooped up. I wanted the life-style I could have up here: do my art, enjoy the outdoors and raise a family. 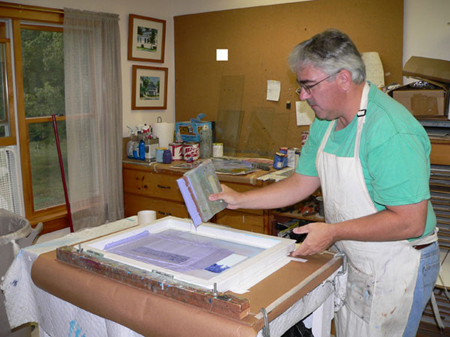 For the past 14 years, Mitchell has done pre-press work in the University of New Hampshire printshop. At nights and on weekends, when he isn’t outdoors, he’s most often in his studio off the garage. There, he works to render his personal vision into a permanent landscape. Starting with a carefully detailed stencil adhered to fabric, Mitchell squeegees ink onto paper. 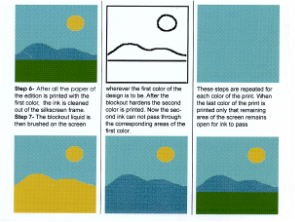 For an eight color print, he begins by covering the whole paper with the first color. Then piece by piece, he dabs a gluelike substance over the parts that should remain that color to mask them from receiving the next layer of ink. Because he has to decide at the beginning of the process how many prints to make, there’s no turning back. If all goes well, an edition of 50 will yield 50 saleable prints, but there are times when he ends up a few pieces short. Beginning with the emotion, he experiments making a painted study and allows himself to be as creative as he can before he gets to the technical side of printmaking. Then he puts himself on autopilot, falling back on a career in which he has developed both patience and technique. Now that the results have the League honoring him for his skill and people coming back for more and more of his prints, Mitchell’s response is what you might expect from someone this modest.